This part of the book deals with the idiosyncratic design structure of Diablo 2, an idea I call Schaefer variation. In this part, we will examine what Schaefer variation is, how it is implemented, and what effect this has on the player's experience of Diablo 2. The shortest explanation of Schaefer variation is that it is a way of recreating the fundamental design structure of mainstream action games in a procedural RPG. To explain this, this part of the book will synthesize information from the first two parts to explain how this effect is achieved. In addition, this part of the book will also cover a directly related phenomenon I call acceleration flow. Acceleration flow is not a design dynamic, but rather a psychological experience that a player can have in RPGs. Acceleration flow is a state of focused euphoria that results from changes in the rate at which a player-character gains levels. We'll examine that phenomenon and how Schaefer variation contributes to it naturally. Many of the design dynamics in Diablo 2 seem to be constructed to keep the difficulty the same at all times. At first glance, this seems like it is incompatible with a phenomenon that has the word “variation” right in it. For example, one of the most obvious over-arching dynamics in Diablo 2 is its level-deterministic zones. That is, monsters in a given zone have a base level, and they don't really vary from that level unless they spawn as champion or unique monsters. Even then, the variation in monster level is minimal. The monsters in the Tamoe Highland on Nightmare difficulty, for example, are level 39. Champions in that zone are level 41. Uniques in that zone are level 42. All of the damage, HP, defense, attack rating, and EXP values in that zone are a product of monster level and monster type (and procedural affixes, if the monster has any). 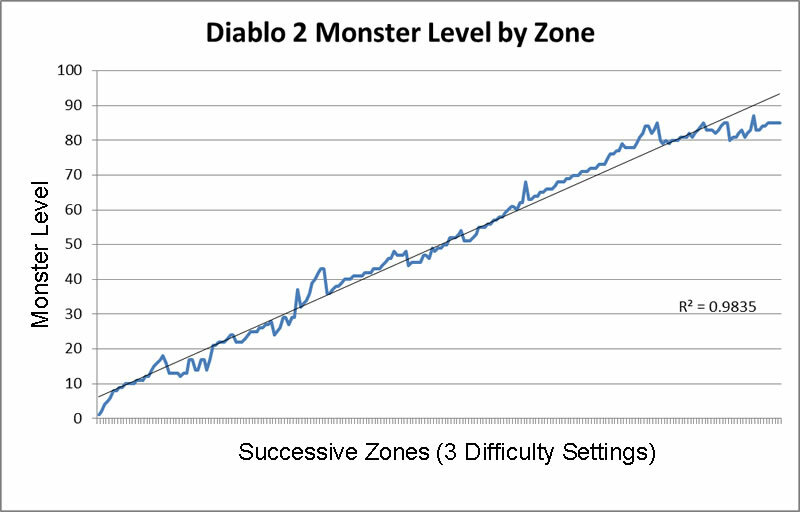 And for the most part, all of the zones in Diablo 2 increase in level in a linear way. Most of the steeper rises in the graph are in act five of each difficulty setting, but there aren't any major peaks or valleys at all across the rest of the game. The r-squared value does illustrate how linear monster level is across the mandatory zones of the game. Does the linear shape of Diablo's level determinism mean that the difficulty of the game is almost always exactly the same? No, and there are several reasons why not. The first reason is that the game is an action RPG, so enemy level doesn't always tell you everything. Enemies also have action-game attributes which can make them harder or easier to kill. Run speed, projectile speed, and sprite size are three dimensions which are not always balanced in accordance with monster level. Enemies like the Leaper and Fetish all move quickly, relative to a normal-speed character. They do less- than-normal damage for the areas in which they appear, but the player has a harder time avoiding or escaping them. Incautious players can easily find themselves swarmed by huge packs of these monsters and unable to lose them, especially when their character’s stamina runs out. Nowhere is this worse than in the jungles of Act 3, in which large numbers of Fetishes can rapidly fire dozens of projectiles which move fast and are often hard to see against the background color of the map. Trying to hit these small, fast-moving enemies can be equally frustrating; even clicking their sprites can sometimes be difficult. Players with great defense stats or tremendous damage output can overcome these problems to some degree. But that still means that these zones are harder than their level might suggest. Map generation is another area in which it's possible for procedural generation to yield a sudden spike in difficulty without any unusual changes to monster stats. As we saw in the map generation section in part two, every map card in the procedural deck has several possible landing spots for procedurally generated enemies. Although there are maximum population limits for each landing spot and for the map as a whole, no part of the algorithm guarantees an even distribution of enemies. If the enemy distribution algorithm happens to place enemies in a cluster on the map, the game can suddenly become more difficult for certain types of characters. This effect is magnified if one or more of those enemies is a unique monster with special affixes. A large crowd backed by a unique monster and his elite pack greatly increases the damage and danger they can output. This is especially true if one or more of the unique monsters has an aura affix, directly augmenting all of the nearby monsters. Under these conditions, a moderately difficult cluster of packs can become quite vicious, and often even the best players will reload their game to clear it. Of course, there are also places where the game gets easier through procedural means as well. Sometimes, there is an enemy who is weak to the player’s build, or one that has a behavior that the player can exploit. Sometimes greater ease comes from an item drop or a new ability which gives the player a surge in power. The important thing to know about Diablo 2 is that there are many peaks and valleys in the difficulty of the game, despite the constant level determinism. The surges in power are a little more important, psychologically, than the surges in difficulty, but we’ll take a look at both in this section. Act bosses are a great place to examine both peaks and valleys in difficulty, and how both of those things are created by the game’s mechanics. By one definition, act bosses are clearly harder than the rest of the content of the game. Act bosses are usually about 10 levels higher than the zones they inhabit, in addition to having tons of extra HP and many deadly attacks. But to offset this, bosses also yield significantly greater rewards. Not only is act boss EXP usually about 40 times higher than normal enemy EXP at the same level, but bosses also have a higher number of maximum (and average) drops per kill. Moreover, bosses are more likely to drop magical, rare, set, and unique items than common monsters. So although bosses are more difficult in one sense of the word, players don't always think of boss fights as making the overall game "harder" in the same way a jungle full of Fetishes shooting darts makes the game harder. This brings up an important point about the perception of difficulty in RPGs. Players of RPGs do not necessarily think of the difficulty of the game as being only a product of how hard it is to kill individual monsters. Rather, players perceive the difficulty of an RPG to have to do more with the ratio of rewards over time, what I'll call the R/T ratio from now on. Diablo 2's act bosses are obviously much tougher than regular monsters, but they provide such a large amount of reward that the R/T ratio doesn't decrease. (The numerator in this ratio can be any kind of reward, like EXP, gear, runes, gems or gold, or any combination of those things.) Indeed, the ratio might actually increase when a player figures out how to handle a boss's behavior patterns, or finds a build which allows them to quickly dispose of a particular boss. There's another important bit of information on the graph above: after an organic acceleration, there's a corresponding deceleration that happens immediately afterwards. Almost all organic accelerations have the corresponding deceleration, because their primary reward is experience points. (You can see the deceleration marked by the number two on the graph above.) 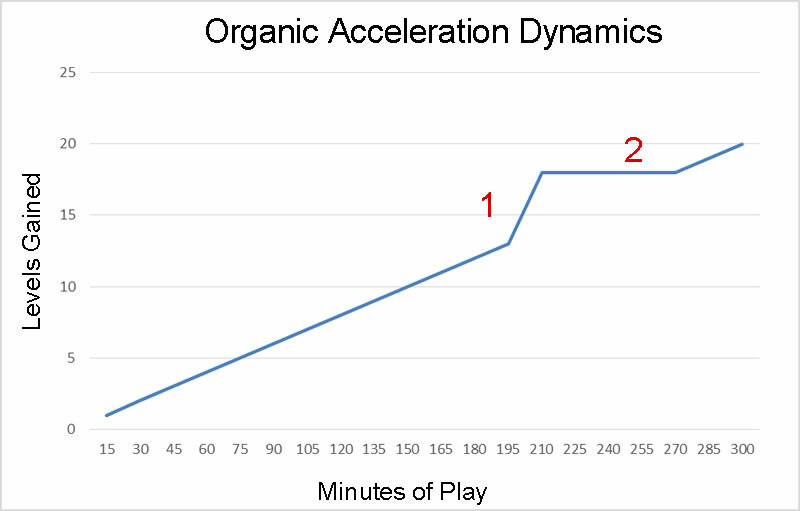 When a player uses an organic acceleration to gain a few levels in quick succession, he actually devalues the rewards of the next few areas or dungeons. Whenever a player enters a new dungeon at a higher level than necessary, the EXP rewards will seem relatively smaller. In Diablo 2, this effect is magnified because players are penalized for killing lower-level enemies. 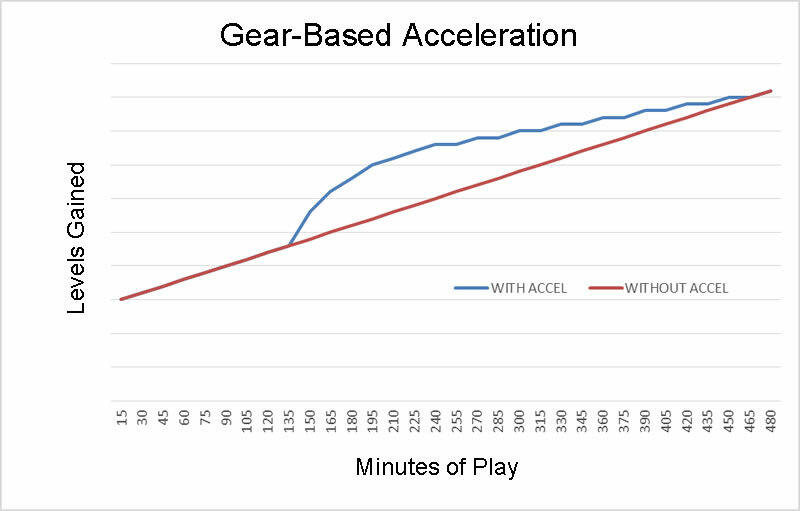 This deceleration can sometimes be so frustrating that it spoils the euphoria that the player was experiencing during the acceleration. Advanced players often skip the decelerated part of the curve by running through certain zones. By the mid-2000s, experienced Diablo 2 players were often accelerating in a few key spots, like Tristram, the Tombs, Throne of Destruction, etc. and not even engaging with the rest of the game's content. But before that became a widespread practice, the deceleration was a widely-experienced downside to the organic acceleration. And it was meant to be that way, because the Diablo 2 designers had something else in mind for bigger and less frustrating accelerations. The organic acceleration presents a problem for the thesis of part three of this book. How can I claim that Diablo 2 benefits from accelerations and acceleration flow if the resulting decelerations cancel them out? The answer is that there is more than one kind of acceleration, and Schaefer variation provides a kind of acceleration with a softer landing, so to speak. If the organic acceleration is the basic model of accelerations in general, the unique weapon drop is the basic model of Schaefer variation. Let's say that a level 24 paladin clears the River of Flame, and one of the monsters there drops the unique grand scepter Rusthandle. That paladin is currently using a magical (blue) weapon of significantly less power than the unique drop. Suddenly, that paladin is a lot more powerful, and can kill enemies at a significantly faster rate. Thus, the R/T ratio grows in the player's favor. The rest of this book is only available as an eBook. Click through to the books page to get a preview of the eBook. You can still continue through to the conclusion and citations on the next page.